I did it. I bought couches. Correction: I bought A couch. And 2 chairs. They are neither chocolate brown nor leather. HOWEVER. They are sage green and microsuede. Which I find as a colour, slightly more calming, and as a material, a whole lot more cuddly. They more than likely will not survive more than 3 years, but I have accepted this and moved on from it. 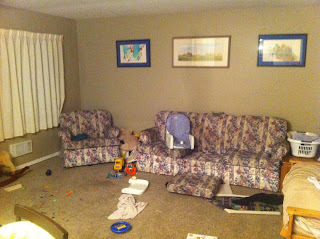 Like a good little furniture purchaser, I sprayed the couch and chairs down with that fabric protector stuff two nights in a row... Desperately hoping it will keep the jam-fingers at bay. So the Bubonic Plague couches have not yet been destroyed. I am not sure when we will be burning them (or if we even will be...) But I can assure you that if we do, there will be photos !!! Good Morning Steve Jobs, way up there in the sky. I have a nasty bad habit of "random texting". It's chronic. It's hilarious. It's occasionally not met with the same enthusiasm by the receiving party. Raspberries to them I say! Unnamed friend: But it's Saturday? Unnamed friend: Have you ever been tested??? Me: Epic fail putting the open chocolate bar between my legs while I drive !!!!! Me: Attention, this is the captain speaking... We've run out of coke and me mateys are quite parched!! Unnamed male friend: What the hell are you talking about. Who is the captain. What does parched mean. Where are you? Me: They arrested her mom!!!!!! Me: They arrested her, mom!!!! So in conclusion, I thank all of you receivers of randomness for not just going ahead and blocking my number, and putting up with all of my pointless texts and updates through out the day. And thank you auto correct for endless laughs. And thank you iPhone for confusing the crap out of me!!! ......And say hello to BONDED LEATHER. It's wipeable, it's fashionable, and it's chocolate brown. It's happiness in a sofa. Plain and simple. It has taken me a looooooong time to finally get off my wallet and make the move. But I think it will be a good one. I might actually stay home once in a while. But this brings me to my new issue. New couches, HOORAY!! But how about that 1992 Tube TV that I am going to be watching from said couches? Is it time to part with that as well? Can I wait a few months? How about till Boxing Day? Probably not. I have a bad case of Needsititis, which is an acute onset swelling of the Needsit portion of the brain. It can feel like it is a chronic issue, however, if you push through the pain, the swelling eventually subsides, and you become ok with your life the way it is, materialistically speaking. 1) I have icky sticky 2 year olds, TWO OF THEM!! After this past week, I think it’s safe to say I will not be colour blind anymore J I saw some pretty awful “true colors” from quite a few people. And I am happy to say I have “deleted” their information from my iPhone so there is no going back. Because we all know that I live by my iPhone. And it doesn’t matter if I wrote it down somewhere, if it’s not in my iphone it does not exist! TAKE THAT! Let the colours shine on !! If there is one value I hope to instill in my children more than any other, it would be acceptance. Without acceptance of any amount, I think the world would be a whole lot scarier. I'm not blind to the fact that there is a severe lacking in the acceptance department by humanity as a whole, but I believe that at a fundamental level acceptance is a learned skill. It is not one that you are born with, but rather, taught to you at an early age, and formed and molded throughout your years. Like many other things, if acceptance is not a cornerstone in your parenting, your children will not have the self image and self respect required to make the life journey. Without getting all technical mumbo-jumbo on you, I will try to explain my point of view. If a child is not taught that it is OK to be different from others, they will not only bully other children but will have internal thoughs of disrespect towards themselves. For example, if Billy's different because he's bigger than the rest of the kids, then I must be different because I'm one of the smaller. This seems to me to be one of the more crucial errors we as parents make. Children are not deaf; they hear us talking amongst other parents about these types of things. They hear our views and adopt them as our own. This is what I like to call "Parenting Fail".... And I'm no angel ... let it be known. With this in mind, think of how well they hear and SEE us as parents talking to or about each other? We all to often forget, through our adaptation to spoken language, that as a species, our initial language was BODY language. We don't always realize that what we say with our bodies speaks volumes more than what we say with our tongue. "Do as I say and not as I do" .... is garbage. Our children are much more basic than we are. They are still learning and developing their language, and are basically programmed to read our body language before they're able to fully understand our spoken language. If we teach our children to accept love, we must teach them what an acceptable measure of love is. We must teach them that love is a gift that is given. Much like trust, Love can easily be broken. And without proper care and attention, Love will not heal properly. Accepting broken love is not acceptable. Does this make sense?? Our kids know when we are hurting. They see it in our faces, in the way we carry our bodies, as well as in the tone of our voice. We are unknowingly teaching our children it is acceptable to feel the way we feel. We are teachers, they are students, and we are teaching them to accept our acceptance of something unacceptable. I know it may sound as though I am putting my jaded attitude towards love and marriage onto my children, but it was gonna happen anyway. Atleast in this way it is a gentle approach. After my blog post yesterday, I thought of a few things I really felt I needed to add. I've done some soul searching over the past few months and have learned a few new things about myself and about others. It seems as though so many of us are searching for the same thing. Someone to love and be loved by, someone to cherish and be cherished by, someone to serve and be served by, and someone to be there in the thick of it all. It doesn't seem like it should be so hard, does it? They are very simple values. They seem attainable. You see the young couples with the smiles and soft words between them, and you see the happiness in the eyes of the seniors who have been with their love for 65 years or more. My beliefs and values have changed with the rolling tides of my life. Battered and beaten by angry storms, my heart has ached and felt the excruciating, crushing pain of loss. Glowing with pride and joy, my heart has pounded with excitement and love. I knew so early on in my relationship with Ben that we would get married and have a family. I knew with all my heart that he was the man for me. I knew we would be the ones who would make it through the brutal storms. I knew it.... I knew I knew it. Until one day I became confused. And not in a "Brown shoes or black shoes" sorta way. In a deep, contorted, dark and twisty kind of way. The kind of confusion that makes you start to question your own sanity, your own clarity and your own worth. Do I love him enough to stay? Do I hate him enough to go? At first, it was easy to stuff the questions back down into that dark and twisty place. And close the door. And lock it and throw away the key. But like Edgar Allan Poe's Tell-Tale Heart, I couldn't ignore them. They pulsed and surged and throbbed in my mind and as much as it hurt to think about them, I finally stopped denying myself that oppurtunity. It didn't take long before my heart took over and decided for me. The choice I made did not make me a bad person. I see many other couples struggling to survive, but out of fear of judgement and rumors, they stay. They stay in pain and in anguish which only grows heavier and heavier every day. The pain is visible on their faces and the anguish evident in their eyes. I chose what I chose based on my own beliefs and values. I believe I am worth more and deserve more, and I value my own self image and self worth far too much to allow it to disintegrate. The more you deny yourself the chances to be happy, the more hurt you feel. You hope and pray and tell yourself it will all work out and that you're just going through a rough patch. Which, understandably, is very common and true with many relationships. There are always ups and downs. However, if the ups don't cancel out the downs, you end up with a negative balance at the end of it. And I'm pretty sure we're all on the same page as far as negative = bad, positive = good. Or so I hope anyhow. Marriage should be a give and take relationship. You give, you take. Yes it is true that you should give more than you take, because otherwise it would be selfish. However, if one person is consistently giving of themselves and not getting enough in return, they will feel as if they are slowly emptying. Picture a cup, for example. Ok OK! 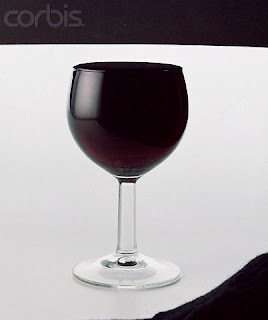 A wine glass. I will fill my wine glass with wine. I then take that wine and pour half into my husbands cup. I pour some in my children's cups (relax, its a metaphor!) Oh and some in my mother and father's and stepmother's cup. And my sister and brother's cup. Oh and friends'. Pour some in the work cup as well, because no matter what I do I can't get away from that one. At the end of the day, I have little more than a sip of wine left in my cup, which, unless it is replaced, will not be enough to stretch to do it all again the following day. And in your marriage, the one person who should help fill that cup is your husband, or your wife. Unfortunately, I was leaning more on my family and friend's to fill my cup than I was on my husbad. My cup was nearly perpetually empty. No one likes an empty cup, everyone HATES an empty wineglass. So I have decided, while staring through the bottom of my empty wine glass, that in order for me to be truly happy, I must budget my wine and giving half of it away to someone who doesn't return the favor is counter-productive. I will no longer give half of my wine away, but better, save it for myself and my children. I will save it for someone who desperately wants to fill my cup. So what I am offering up with this blog post, is the chance to take a glimpse inside the heart of someone who chose to leave. It's not often that people will take the time to sit back and listen to why someone is leaving their marriage. It's just so much easier to assume the worst and to believe the rumors. I love to cook. I love to eat. I love to love. I love to laugh. You now know everything there is to know about.. me!